Lucinda Katherine "Kate" (Martin) Skinner was born on Nov. 6, 1868 in Preston County, WV, the daughter of James K. and Margaret (Minerd) Martin. In about 1890, at the age of 21, Katherine married 25-year-old Walter Herbert Skinner (1865-1931), the son of John and Dorothy Skinner of Harrison County. They had nine children -- among them Lota Belle Davis Valentine, Fred O. Skinner, John Skinner, Laura M. Skinner, James O. Skinner, Edward "Charles" Skinner, Gifford L. Skinner and William W. Skinner, and one who died young. Early in marriage, circa 1900, Walter and Kate resided in Preston County. Just before the birth of their fifth child, James, they moved across the state line to Deer Park, Garrett County, MD. There, Walter was employed as a section foreman with the Baltimore & Ohio Railroad. In about 1905, they relocated again, to the Northview section of Clarksburg, Harrison County. 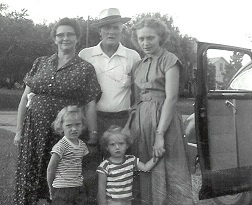 When the federal census was taken in 1910, the Skinners lived in the Coal District of Clarksburg, with Walter working as a laborer in a grocery store. By 1920, Walter was earning a living in "labor - public work," while his sons John and Charles were employed in a glass factory (likely the Hazel Atlas Co. plant), and son Gifford, age 16, as a teamster hauling stone. In the early 1930s, they lived with their married daughter Lottie Valentine and her family at 1506 Eighteenth Street in Clarksburg. They were members of the Northview United Brethren Church. Suffering from gallstones, Walter was rushed to a local hospital and died just a week after his 66th birthday, on March 5, 1931. The Clarksburg Exponent said that "His condition had been critical for several hours prior to his death" and added that he was a "lifelong resident of this county, having been born and reared in the vicinity of Clarksburg and was well known in this section." Katherine outlived her husband by four years. After enduring disease of her heart, she died on May 30, 1935, at the age of 65. She was laid to rest beside her husband in Greenlawn Cemetery in Clarksburg, following a funeral at the Northview United Brethren Church. Her daughter "Mrs. A.O. Valentine" was the informant on her death certificate. Daughter Lota Belle Skinner (1891-1965) was born on Sept. 22, 1891 in or near Deer Park, Garrett County, MD. She was married twice. At the age of 18, she first wed 30-year-old Asia Gilbert Davis (1879- ? ), son of George H. and Mary Florence Davis. The ceremony was held on Oct. 26, 1909 in the parsonage of the Methodist Episcopal Church at Adamston, WV. When the federal census was taken in 1910, the newlyweds lived on Coal Street near Clarksburg. Boarding in their home were Asia's widowed father George and single sister Bertha A. Davis. Asia's occupation that year was as a streetcar company laborer. The marriage ended sometime between 1910 and 1914. By 1914, Lota married her second husband was Arthur A. Valentine (1888-1943). They produced at least two sons -- Harry H. Valentine and Homer Wayne Valentine. When the federal census was taken in 1920, the family lived on Bryan Avenue in Clarksburg, where Arthur was a laborer at a glass plant. The 1930 census shows the Valentines living at 1506 North 18th Street in Clarksburg, next door to Lota's married brother and sister in law, James and Minnie Skinner. Arthur's employment that year was as a machinist in a glass plant. They remained at this address for the rest of Lota's life. They belonged to the Church of God at Northview. Suffering from hardening of the arteries beginning in about 1957, Lota was stricken with a massive stroke on her right side. She passed away at the age of 73, in Clarksburg, on June 19, 1965. She was interred in Clarksburg's Greenlawn Cemetery. Harry Valentine of Clarksburg was the informant on her death certificate. At her death, reported the Clarksburg Exponent, she was survived by five grandchildren and one great-grandchild. Son Harry H. Valentine (1914- ? ) was born in 1914. He is believed to have married Lulu Mae Howell (1914- ? ), a native of Maud, Wetzel County, WV. Their wedding was held on July 1, 1935, in Clarksburg. In 1965, his home was at 2203 Gould Avenue in Clarksburg. Son Homer Wayne Valentine (1919- ? ) was born on Aug. 15, 1919, in Doddridge County, WV. He married Mary Lee Robinson (1926- ? ), daughter of Orace and Opal (Pitts) Robinson, of Harrison County. Their marriage took place on Dec. 16, 1945, in Clarksburg. He resided at 1506 North 18th Street in Clarksburg circa 1965. Son Fred Oscar Skinner (1892- ? ) was born in April 1892. He married Minnie Pearl Wolfe (1898- ? ) in about 1916. They had at least three children -- Lenoa Skinner, Wilbert Eugene Skinner and Everett (?) Skinner. When the federal census was taken in 1930, the family lived at 2209 Gould Avenue in Clarksburg, next to Fred's younger brother Gifford and family. Fred's occupation was listed as clerk in a grocery store, and Gifford's as a driver for the store. They remained at this address for decades. Fred's fate is not yet known. Son Wilbert Eugene Skinner (1922- ? ) was born on Aug. 13, 1922 in Clarksburg. He married Ruth Elaine Matson (1926- ? ), daughter of James and Maxie (Cox) Matson. The marriage took place on May 9, 1947, in Clarksburg. Grandson James Ray Skinner (1950- ? ) married Tondalaya Garcia, daughter of Emelio and Kathleen (Fisher) Garcia, on Dec. 6, 1969. Son John Flavy Skinner (1893-1967) was born on June 27, 1893 (or 1895) in Terra Alta, Preston County, WV. During World War I, John served in the U.S. Armed Forces and was involved with the Battle of the Meuse-Argonne. He married Merle Cosby Brake (1898- ? ), daughter of Lloyd and Phoebe E. Brake, on April 16, 1921, in Clarksburg. She was a native of Upshur County, WV. He was age 27, and she 23, at the time of marriage. They had two children -- Jerry Skinner and Virginia Gillespie. John and Merle initially made their home in Terra Alta. Later, they moved to Clarksburg, Harrison County, and occupied a home at 1920 West Virginia Avenue. John was a longtime employee of the Hazel Atlas glass company, a division of Continental Can Company, in Clarksburg. They were Methodists. John was a member of the Meuse-Argonne Post of the Veterans of Foreign Wars, Stonewall Barracks of the Veterans of World War I and the Disabled American Veterans. He died at the age of 71, in St. Marys Hospital in Clarksburg, on April 2, 1967, after suffering from cancer of the esophagus. He was laid to rest in the Floral Hills Cemetery in Clarksburg. His obituary in the Clarksburg Exponent erroneously gave his mother's maiden name as "Miller" instead of "Martin." Son Jerry Skinner lived at home in 1967. Daughter Virginia Skinner ( ? - ? ) married Paul Gillespie ( ? - ? ). Their residence in the 1960s was Warren, Trumbull County, OH. Daughter Laura May Skinner (1897-1953) was born on March 8, 1896 (or 1897), in Preston County, WV. At the age of 19, she married 22-year-old Okey Isaac Osborne (1894-1960), also spelled "Oakey," son of Isaac "Mac" and Florence Osborne (or "Osburn"), on March 5, 1916, in Clarksburg. Rev. H.R. Hess officiated. Okey was a native of either Harrison or Lewis County (records differ) and lived in Clarksburg at the time of marriage. The couple produced eight children -- Kathryn Hawkins, Odella Belotta, Ruth Summers, Willa Jacquez Cartmell, Harley Gene Osborne, William "Bill" Osborne, Charles Edward Osborne and Argille Osborne. Another child, believed to have been son Cecil E. Osborne, was born in 1919. In 1920, they dwelled in Clarksburg, Harrison County; in 1935, they lived in Fairview, Marion County, WV; in 1940 in Clay, Monongalia County, WV; and in 1953 in Baxter, Marion County, WV. Federal census records for 1920 show that Okie was employed as a coal miner in Clarksburg.. By that time, three of their children had been born. When the federal census enumeration was made in 1940, Okie was employed as a machine man for Koppers Co.'s coal operations near Morgantown, WV. Laura died of a heart attack at the age of 57, in Fairview, on Oct. 30, 1953. She was laid to rest in Fairview Cemetery in Fairview. A brief obituary in the Fairmont West Virginian said that Rev. E.J. Johnson would officiate at her burial, to be held at the Wesley Methodist Church of Fairview. Okey outlived Laura by seven years. In 1955, at the age of 62, he married again, to 42-year-old Freda Ammons (1912- ? ), daughter of Isaac and Mertie Ammons. He was 20 years older than his second bride. They lived along Route 2 in Fairview. He passed away on Sept. 21, 1960, of a heart attack, at home. The funeral was held at the family church, led by Rev. Harlan Dague. At his death, said the West Virginian, Okey was survived by 17 grandchildren and two great-grandchildren. Daughter Ruth Osborne (1917- ? ) was born in about 1917. At the age of 19, on June 2, 1936, she married 30-year-old Gerald Summers (1906- ? ), a native of Marion County. Because she was legally underage, Ruth's father had to provide his consent to the union. Rev. E.V. Swan, of the Methodist Episcopal Church in Fairview, officiated. The couple asked that their marriage not be publicized. In 1960, they resided in Fairview. Daughter Kathryn Osborne (1919- ? ) was born on Dec. 27, 1919 at Clarksburg. On June 10, 1941, at age 21, she married 23-year-old William E. Hawkins, Jr. (1917- ? ), son of William E. and Sarah Hopkins Sr. of Fairmont. Rev. Foster L. Jones officiated in the ceremony held at Meadowdale, WV. They lived in Fairmont. Son Charles Edward Osborne (1921-2000) was born on May 12, 1921 in Clarksburg. He wed Philippi native Violet Pearl Golden (1929-2014), daughter of Dewey and Esta Mary Ellen Golden, when he was age 24 and she 17. Rev. Henry R. High officiated at the wedding held on Dec. 27, 1946, at Fairmont. On their marriage license, the couple requested that the news of their nuptials not be published. They had three daughters -- Donna Lynn Wise Neukum, Nila Ellis and Sandra Goettsch. The Osbornes made their residence in 1960 in Akron, OH. Later, they relocated to Texas, settling in Dallas County. Charles passed away on June 29, 2000 in Richardson, Dallas County. Violet survived her husband by more than 14 years. She died on Dec. 22, 2014 with interment in Dallas' Restland Memorial Park. Son William "Bill" Osborne (1922- ? ) was born on Dec. 17, 1922 at Clarksburg. He married Betty Michael (1923- ? ), daughter of Ray and Ortalo Michael, when he was age 23 and she 21. The ceremony took place on Sept. 2, 1945, at Fairview, overseen by Rev. E.E. Smith. Betty was a native of Rivesville, Marion County. The Osbornes had three sons -- William Osborne, Edward Osborne and Gary Osborne. They lived in 1960 in Akron, OH. Son Argil (or "Argille") Osborne (1928- ? ) was born in about 1928. He moved to Ohio and was there in 1960. Daughter Odella Osborne (1930- ? ) was born in about 1930. She wed (?) Belotta and made her home in 1960 in Fairmont. Son Harley Gene Osborne (1932- ? ) was born on Jan. 3, 1932 at Grant Town, WV. At the age of 20, he wed 22-year-old Deloris Barker, daughter of Henry and Bertha (Lancaster) Barker of Morgantown. Rev. C.E. Brandt, of the Central Methodist Church, officiated at the wedding, held on May 27, 1950 at Fairmont. Harley eventually moved to New Mexico and was there in 1960. Daughter Willa I. Osborne (1933-2001) was born on March 12, 1933. She was married twice. Her first husband was (?) Jacquez, and they had five children -- Henry Jacquez, Frank Jacquez, Brian Jacquez, Linda Hill, Laura Engelhart. In 1960, her home was in Cincinnati, OH. She married again, to (?) Cartmell. They produced one son, John Cartmell. Willa resided for many years in Loveland, Clermont County, OH. She passed away on Jan. 6, 2001. Grandson Brian Jacquez (1956-2004) was born on May 7, 1956. He was a parishioner of St. Saviour Church in Cincinnati. Sadly, he died at the age of 44 on Jan. 5, 2004. Son James Otha Skinner (1899- ? ) was born in July 1899 in Garrett County, MD. He married Minnie Letha Monroe ( ? - ? ), daughter of Earl and Carrie Monroe, on Nov. 26, 1919, in Clarksburg. They had two known children -- Robert Randal Skinner and Avis Lenora Robinson. When the federal census was taken in 1930, the Skinners lived next door to James' married sister and brother in law, Lota and Arthur Valentine, on North 18th Street in Clarksburg. James worked that year as a coal mine laborer. Circa 1965-1967, his home was on Richards Avenue in Clarksburg. His fate is not known. Son Robert Randal Skinner (1921- ? ) was born on Dec. 3, 1921, in Clarksburg. He married Mary Jane Fincham (1920- ? ), daughter of Ernest and Magdalene (Heater) Fincham, and a native of Glen Falls, Harrison County. The date of the nuptials was July 21, 1941. At the time of marriage, Robert resided at 1802 Richards Avenue in Clarksburg. Daughter Avis Skinner (1925- ? ) was born on March 13, 1925, in Clarksburg. On Aug. 7, 1948, when she was age 23, she married 21-year-old Paul Dennis Robinson, son of Fred Paul and Wilma Agnes (Shreves) Robinson. Paul was a native of Hepzibah, Harrison County. Son Edward "Charles" Skinner (1902- ? ) was born in 1902. Nothing more is known. Son Gifford Lee Skinner (1905- ? ) married Nina Joy (or "Nilda" or "Mira") Edgar (1906- ? ), daughter of Richard and Mattie Edgar, on Oct. 17, 1923, in Clarksburg. She was a native of Webster County, WV. They had two known children -- Thelma Frances Skinner and Richard Lee Skinner. They resided at 2211 Gould Avenue in Clarksburg. At the birth of their daughter Thelma in 1924, Gifford listed his occupation as "merchant" on the birth certificate, and when son Richard was born in 1927, he gave it as "grocery clerk." When the federal census was taken in 1930, the family lived on Gould Avenue, next to Gifford's elder brother Fred and family. Oscar's occupation was listed as driver for a grocery store, and Fred's as a clerk for the store. Circa 1967, his address was 2211 Gould Avenue in Clarksburg. Daughter Thelma Frances Skinner (1924- ? ) was born on July 13, 1924 in Clarksburg. Son Richard Lee Skinner (1927- ? ) was born on April 25, 1927 in Clarksburg. Son William Herbert Skinner (1908- ? ) was born in 1908 in Harrison County. He married Beatrice Lenora "Beatrix" Brown (1909- ? ), daughter of James W. Brown, on April 2, 1927. He was age 19, and she 18, at the time of marriage, and parents of both had to provide written consent. At the time, he lived at 2209 Gould Avenue in Clarksburg, and she at 1404 14th Street, also in Clarksburg. They had two known children -- Luella Rhea Skinner and James W. Skinner. Their home was at 2209 Gould Avenue. In 1927, William labored as a coal miner. The 1930 census of Clarksburg lists this family living in the same Gould Avenue neighborhood in Clarksburg as William's brothers Fred and Oscar. That year, he was employed as a glass factory worker. By 1965, William had relocated to Phoenix, AZ. Nothing more is known. Daughter Luella Rhea Skinner (1927- ? ) was born on Nov. 4, 1927.